The Finnish Army will return to the Air Tattoo flying display this summer as the air arm has confirmed attendance of an example of the NH90 TTH helicopter. The visit also coincides with the 10th anniversary of the type in Finnish Army service, with deliveries commencing in 2008 to the Utti Jaeger Regiment, responsible for Special Forces and rotary aircraft operations. 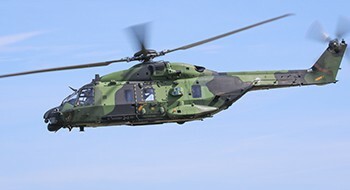 A second aircraft will also join the show in the static display - meaning that visitors will get a chance to see the NH90 TTH in the skies as well as up close on the ground. In 2017 the Finnish Defence Forces provided an NH90 for static display, as well as the Finnish Air Force Midnight Hawks display team, during the 100th year of Finland's independence.